“Timeless” is an exclusive monograph of fine art photography in black and white of the city of Venice, by fine artist Rafael Rojas, Master Hasselblad 2014 photographer. The photographic plates contained in the book tackle the subject matter from an artistic and strongly personal point of view, with the aim of transcending a merely documentary photographic approach to Venice. The photographs, frequently focused on intimate details, lesser-known areas of the city and very personal interpretations of better-known locales, are subtle, sometimes minimalistic, highly atmospheric and filled with a sense of silence, calm and timeless character. In this art book, the city of Venice becomes a visual metaphor for the duality of time. On one hand, there is a timeless character which seems to reign over the entire place. Due to the lack of references and its uniqueness, Venice seems to be an architectural mirage that defies the conventions of reality and seems to have been there since the origins of this world. On the other hand, Venice is the perfect metaphor for the passing of time, for change, for decay, for the ephemeral existence of a banal world anchored to reality. "Timeless" is a magical, award winning work of fine art, worthy of a place in the art museums, libraries and private collections of the world. The thousands of hours spent in the making shine through, not only in the amazing and profoundly original pictures, but also in the printing, the paper, the binding and the presentation. It brings a totally new view to one of the most photographed cities in the world. Seminal! The book is absolutely magnificent. Every single photograph is filled with mystery, where a very intimate level of light permeates it all. Turning the pages becomes a wonderful journey, filled with strong emotions. I really love it. The paper is particularly beautiful, and the overall quality of the book is of the highest standards. It is a splendid book and I am very proud of owning one. The fine print accompanying the book is simply outstanding, displaying an almost surrealistic perspective...I will have it framed soon and I cannot wait to hang it from our walls. I had waited until Sunday to really enjoy this beautiful object with the calm and attention it deserves. I already expected a wonderful book in terms of the quality of its photographs and its presentation, but to be sincere, it goes well beyond that...I simply cannot find the words, such is the level of beauty, poetry and subtlety of the book. Bravo. Yesterday I received your book, wow… I don’t really want to call it simply a book, it is much more than that. Beautiful finishing as meticulous as I expected from a man of detail like you. It is more than perfect, it’s a jewel. Congratulations! "Timeless" is marvelous in every respect. I wonder how you managed to portray this town devoid of people, in its basic simplicity. The printing quality is also astonishing and quite superior from any photobook I have. Congratulations for a very well-executed piece of work! How is it possible to lose track of time in a city where the extensive remains are the tangible witnesses to the past? 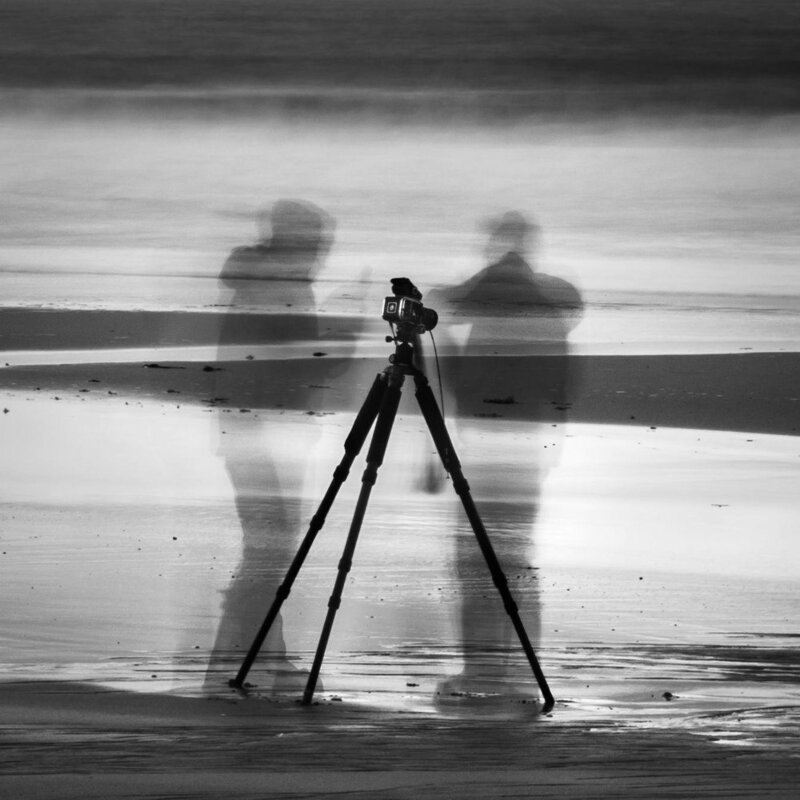 This is the amazing algorithm that Rafael Rojas has superbly realized by playing with the light and his subtle choice of subjects and compositions. From the first page, the book draws our gaze on the details of a ceiling with a clock in the center, referring to the time suspended. Smooth gradations of beautifully contrasting grays give us a 3D impression of the relief. The richness of the fine detail is impeccable and yet, the photographs appear soft and delicate. The book as a whole is true to the mood and the atmosphere and never ceases to amaze us, surprise us. This book depicts a city of Venice at rest and yet full of life! Elements that stand out against the fog, reflections, unusual places and details, traces of human activity that can only be guessed. Rafael shows us a Venice like we have never seen! The most beautiful Venice book I’ve ever seen! All of the photos are stunning and unique. In his book, Rafael manages to capture scenes with no people, making the book truly “Timeless”. He takes you back to the Venice of the past. My mind wanders as I enjoy each photograph. I keep thinking and imagining how life was in Venice hundreds of years ago. I can look at the book over and over again and thoroughly enjoy the experience every time. To top it off, the book’s presentation is elegant and worthy of the content. The first thing that struck me about Timeless was the painstaking attention to detail and to providing a rich visual, subtle experience - and this was even before I bought the book: the dedicated website is a work of art in itself. The physical book fully backs up that impression. It arrives nestled in a black, silver printed slipcase, the book itself bound in vermilion hardcover. The whole presentation is somehow reminiscent of the spirit of La Fenice, an impression reinforced by the frontispiece. The print quality is just sumptuous, with deep, rich blacks and subtle tonalities. At the risk of repeating myself, the care and attention to detail that just leaps out of the pages is quite remarkable.It’s a book to revisit and explore time and time again. Obviously, I fully recommend this book. You should stop reading right now and get over here to order it. 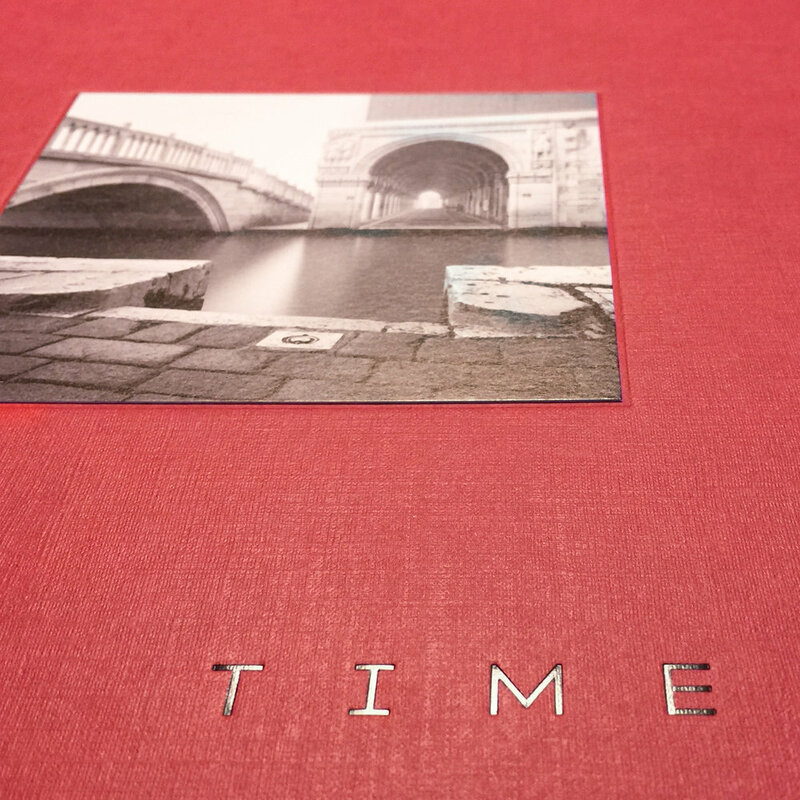 This edition includes the "Timeless" monograph signed by the artist Rafael Rojas. The book is contained in a beautifully made black slipcase in Finenlinen textured paper, stamped with the title and author name. Money back guarantee of 30 days. 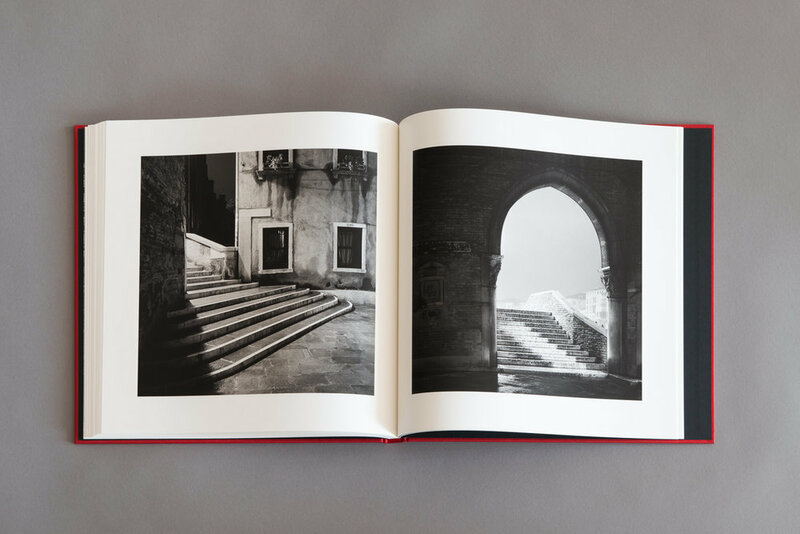 This edition includes the "Timeless" monograph signed by the artist Rafael Rojas and an original Fine Print "Gates of Venice", titled and signed by the artist Rafael Rojas. This edition offers the possibility to own one of Rafael Rojas' original fine prints for a very advantageous price. Original fine print "Gates of Venice"
The Timeless Collector Edition, limited to an edition of 50 copies plus 5 Artist Proofs, includes a signed and numbered copy of the monograph "Timeless" and a Limited Edition handmade Platinum-Palladium print of "City Tree". Both the book and the Platinum print are enclosed in a deluxe coffret designed by the artist himself, lined in numbered and signed by the artist. The original Platinum-Palladium print has been handmade, signed, and numbered by Rafael Rojas, master printer of this exquisite and artisanal photographic process. Every single Platinum Print is unique due to its artisanal character. 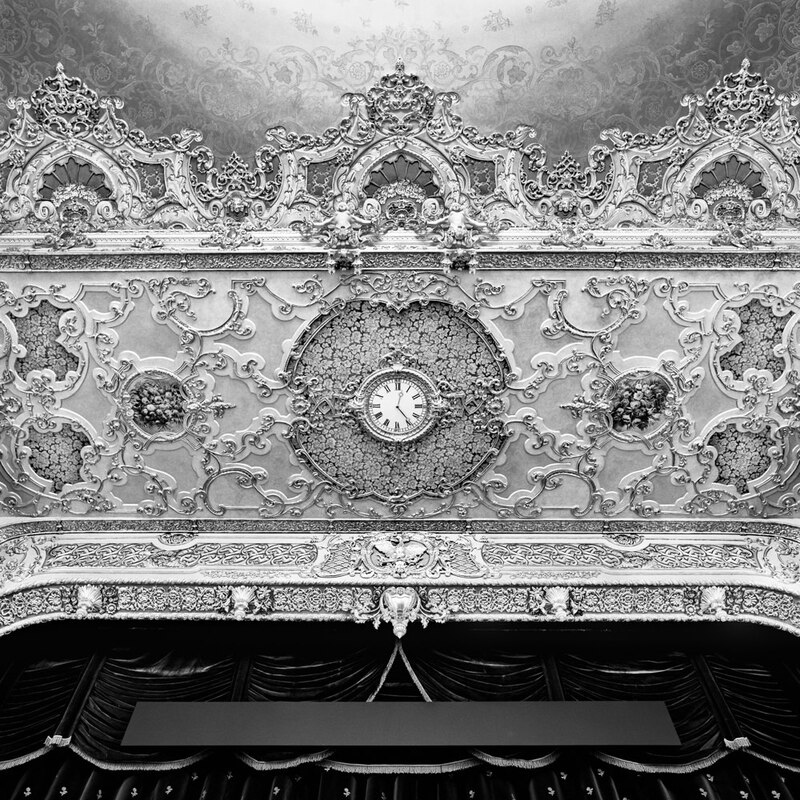 This edition offers the possibility to own one of Rafael Rojas' Platinum Prints of 40x40 cm for a very advantageous price. 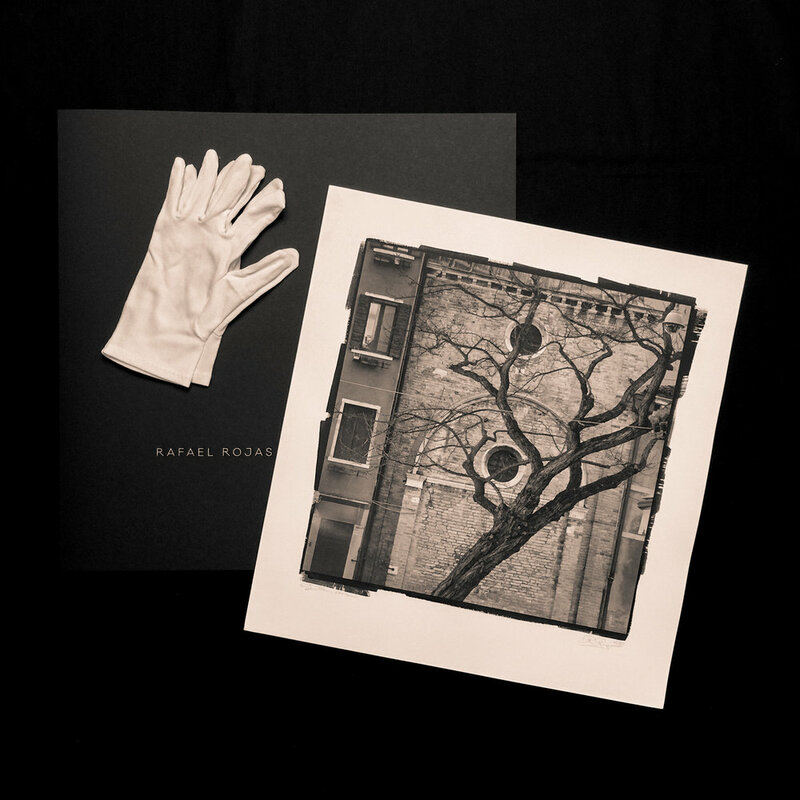 Original Platinum-Palladium print of the photograph "City Tree"
Platinum prints are highly sought after by collectors because of their tonal range, their surface quality, their three-dimensional presence and their extraordinary archival permanence. A platinum print provides the greatest and most beautiful tonal range of any printing method in black-and-white photography, displaying a wonderful three-dimensional presence, a smooth gradation of tones and delicate highlight and shadow detail. No other photographic process is able to render tones in such a delicate and subtle way. Where silver prints display blocked shadows and featureless highlights, platinum unveils subtle and delicate shades of tone and detail, which range from charcoal warm blacks to expanded mid tones and brilliant silvery highlights. The result is prints that seem alive and three-dimensional. Platinum prints are not only enjoyed visually. Their tactile quality, attributed to the nature of the special handmade cotton rag papers with which these prints are crafted, adds to the overall experience. Platinum printing is a totally handmade process, delicate and challenging, for which the highest levels of skill, knowledge and sensibility from the printer are needed in order to create a truly master print. Another distinctive characteristic of platinum prints can be found in their uniqueness, a consequence of the thoroughly handmade nature of the whole process. In fact, no two platinum prints will ever be completely the same, and each of them will stand as a unique object of art. In this way, platinum prints stand apart from the world of mass-produced photographs in silver or digital output. Platinum prints are also the most durable of all photographic processes and one of the most permanent objects of art in which someone can invest. Platinum metal is the most stable element in the world, more stable even than gold, and it is estimated that a platinum photographic print, properly made, can last as long as the paper it is printed on exists, what can mean up to several thousand years. This makes platinum prints one of the most permanent artworks available and the only truly archival photographic process. This art book has been designed and created using the best techniques, professionals and materials. The maximum attention to detail has been paid in order to guarantee the highest levels of quality for this book. We understand our books can be quite an investment for most people, but there is a very good reason why our books are more expensive than those of other publishers. From the beginning, we decided to focus on quality and spend as much time as needed in order to make the kind of art book which is seldom made anymore. We oversee the whole process ourselves, personally involved and always in touch with the best and most passionate artisans, printers and professionals. We choose the best materials, techniques and printing processes. We perform countless printing tests and go through long printing sessions during which it is not unusual to stop the machine, remake all the plates, and start the whole process again, in order to guarantee the highest levels of quality. All this comes at an expense, but at the end of the process we are proud to offer to our clients rare and exquisite books which are made to be enjoyed and kept as a one-of-a-kind treasure. This is for us the best reward, and the best investment we can provide to our clients. We can guarantee our clients pay for the books, and only for the books, by selling our short-run editions directly to our customers and avoiding conventional commercial distribution. Our best marketing is made by word of mouth, awards won and happy clients delighted with their books. We also organize events, lectures and presentations where we meet our clients and share personally with them the passion, love and work which leads to the creation of our books. Museum-quality printing by Fontegrafica, Milano, winners of the Sappi Best Printers of the World Awards multiple times. Ultra-high printing resolution of 254 lines per inch, allowing for incredibly high levels of detail and optical acuity. Images sent to CTP machines in ultra-high resolutions of 700 dpi. Images scanned from original negative film by means of Heidelberg drum scanners. Printing done at the lowest speeds in order to obtain more circular dots on paper. Entire printing of the book is done in the presence of the artist. Numerous printing tests undertaken in order to obtain optimal level of sharpness and acuity for printed photographs. More than ten plates were remade during printing in order to guarantee the highest levels of quality. Three different shades of ink used (black, deep black and pantone grey) instead of the typical duotone printing for black and white, in order to obtain the smoothest gradations of tone. Varnish for semi-matte finish of the paper and protection of printed content applied on all pages. Exquisite detail and extremely rich separation of tones in the shadows and highlights. Extremely high Dmax - rich and intense blacks giving powerful contrast to the images. Exclusive fine art matte paper Scheufelen Phoenix Motion Xantur 170 gsm. One of the most luxurious coated papers in the world. Unique tactile characteristics, soft and silky. Smooth tones and texture-free surface. Featureless blacks, silky and with absence of mottling or other printing artifacts. Increased constant bulk volume due to special mix of pulp fibres. High thickness and volume optical opacity. Excellent reflection of scattered light. Beautiful natural white that complements the tonal rendition of the photographs. Attention to detail, striving constantly for perfection and the most thorough satisfaction of our clients are our highest priorities. This is why we are extremely confident that you will be more than satisfied with your Art Book. However, if you are not delighted with your Art Book for any reason, we offer a 30-day Money Back Guarantee, no questions asked. Should you not be completely satisfied with your purchase, we will refund you the value of your book (shipping excluded) with the shortest delay. Please note, only non-personalized books (not customised by personal dedication or similar) and returned in the original condition in which they were received will be refunded. If any damage occurs during the shipping, please advise us immediately and we will exchange the damaged book at no cost. Rafael Rojas (Master Hasselblad 2014) is a Swiss-Spanish fine art photographer, whose work frequently focuses on concepts like time, decay and renewal, the interaction between humans and nature and its consequence in the natural balance, the raw latent energy found in the landscape and the ephemeral qualities of existence. He strives to encapsulate concept, emotion and spirituality in his work. Venice is not just a city; it is also a visual metaphor about the dual qualities of time and space. On one hand, there is a timeless character which seems to reign over the entire locale. Due to the lack of references and its uniqueness, Venice seems to be an architectural mirage that defies the conventions of reality and that seems to have been there since the origins of this world. Wandering around its canals and squares, it is difficult to imagine that it was all built by man where natural islands once nestled in the middle of the sea lagoon. On the other hand, though, Venice is the perfect metaphor for the passing of time, for change, for decay, for the ephemeral existence of a banal world anchored to reality. Rubbing shoulders with amazing palazzos and glinting cathedrals, a myriad of deliciously derelict buildings shows the scars of time in their peeling facades full of character. Like a living organism, the whole city is aging...Silently, the floating city is gradually sinking as the level of the sea rises. I wanted to photograph this dual nature of Venice. I was seeking photographs which would capture ethereal views of an empty city that seems to float in time and space. Photographs in which I could show the solitude and the silence of a place where human presence is never shown, but implied. Images where extraordinary elements juxtapose with the banal and where anonymous subjects found in the labyrinth of alleys and squares stand proud against the indifference of the world. As Minor White would have said, I was not seeking to photograph Venice for what it is, but for what else it is: A theatre stage of squares, canals and alleys where the very duality of human existence is enacted. Dream versus reality, permanence versus decay, memory versus oblivion.